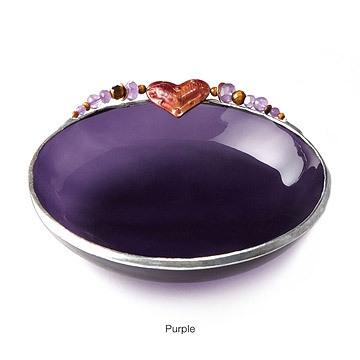 This dreamy, stained glass bowl keeps your precious pieces of jewelry elegantly organized. This dreamy, stained glass bowl keeps your precious pieces of jewelry elegantly organized, on display, and at your fingertips. A handcrafted copper heart crowns your treasures with semi-precious orbs of tiger eye, amethyst, and copper. Handmade in California by Ellen Bartfeld. Wipe with damp cloth. Dry well. My wife uses this dish to put her everyday jewelry in on her bedside table. This is a gorgeous hand crafted plate and makes a beautiful, memorable, heirloom worthy unique gift. I bought this for a friend's birthday. She loves purple and the heart adds a creative and lovely touch. The plate comes with a card about the artist, Ellen Bartfeld, who creates beautiful one of a kind stain glass pieces. I felt very confident that my friend would LOVE this gift and by her enthusiastic and excited reaction I know she really adores it. Other guests at her birthday party enthusiastically admired it as well and wanted to know where I found it. My friend is going to use this dish to hold rings and other small jewelry. I will definitely purchase this again for a gift or for myself. I love that this handcrafted plate comes from UnCommon Goods because this is an extraordinary and exquisitely beautiful "uncommon" gift. Love the color of the glass. It is beautifully crafted. I'm hoping my friend will keep this out on her bedroom sink or bedside table. Gave as gifts to outstanding work colleagues. Much prettier in person! The bowl is as beautiful as the picture, the beads are pretty, but not as pretty as the display picture. Overall it's a nice product. Very nice item. Excellent quality. Wife loves it. Her favorite color also. Lovely product, good quality and I would buy it again!